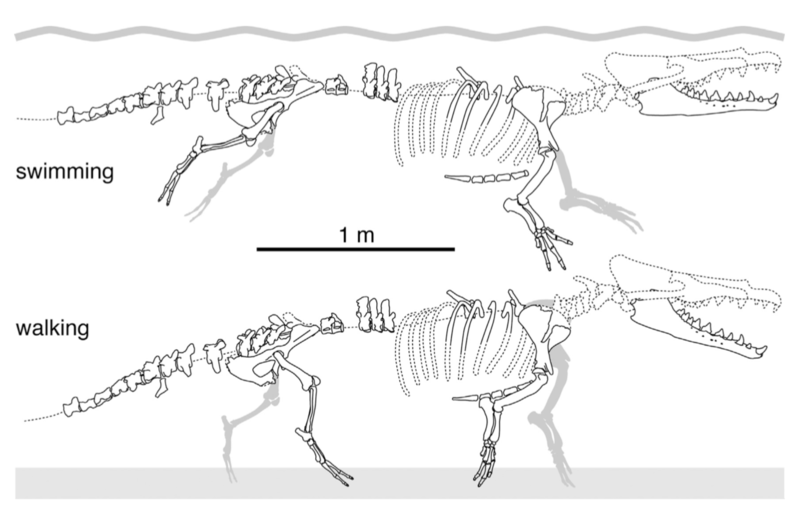 The discovery of a fossilised, 42-million-year-old, four-legged whale is shedding new light on the evolution and geographical spread of these aquatic mammals. 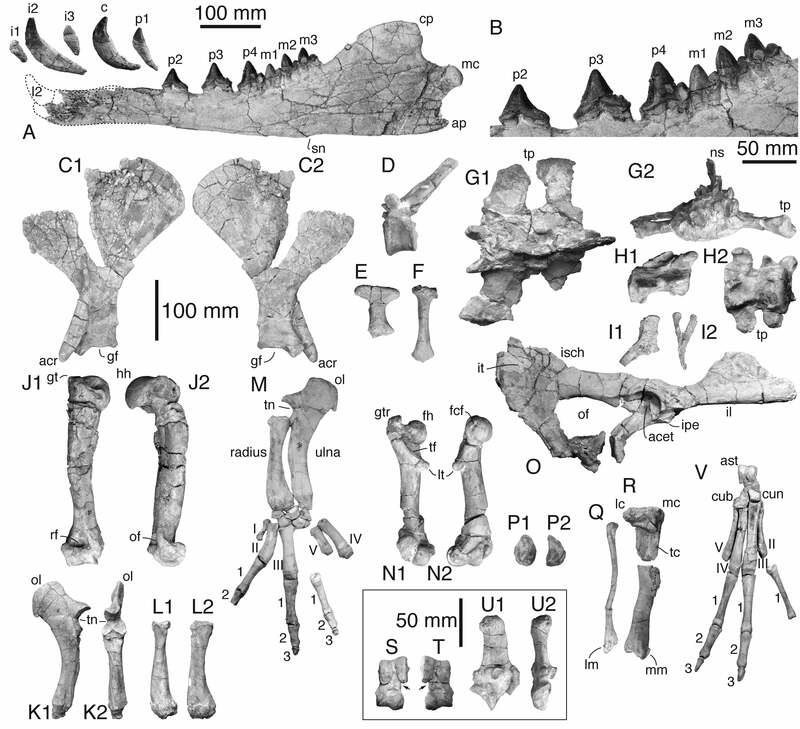 The ancestors of modern whales and dolphins evolved from a small, four-limbed hoofed animal that lived in south Asia around 50 million years ago, during the Eocene. Fossil evidence suggests these aquatic mammalian pioneers reached North America by 41.2 million years ago, swimming from West Africa across the Atlantic. The surprise discovery of a previously unknown, 42.6-million-year-old quadrupedal whale along the coast of Peru has resulted in an important addendum to this story: Ancient whales made South America, and not North America, their first home in the New World. Details of this discovery were published last week in Current Biology. The new species is called Peregocetus pacificus, which suggests “the travelling whale that reached the Pacific” in Latin. Its remarkably well-preserved remains were found in 2011 at a site called Playa Media Luna, where palaeontologists recovered most of its skeleton, including its jaw, front and hind legs, bits of spine, and tail. Dating of the marine sediment within which the fossil was found places Peregocetus to the middle Eocene. “This is the first indisputable record of a quadrupedal whale skeleton for the whole Pacific Ocean, probably the oldest for the Americas, and the most complete outside India and Pakistan,” lead author Olivier Lambert, a palaeontologist at the Royal Belgian Institute of Natural Sciences, said in a statement. 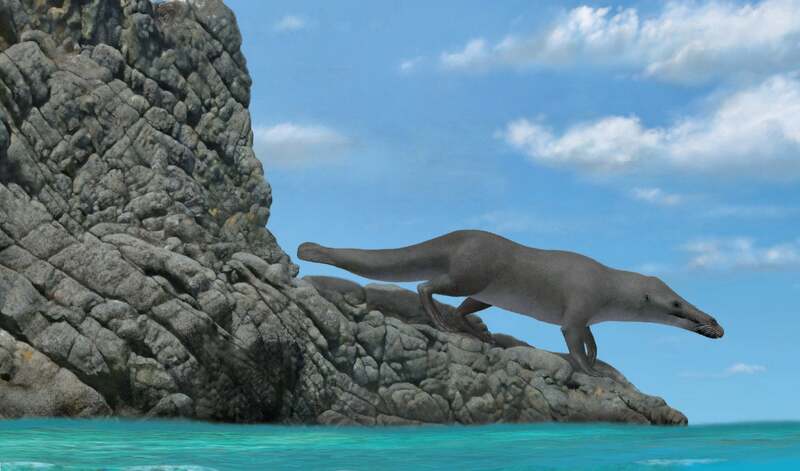 Analysis of the Peregocetus fossil shows it was well adapted to both land and sea, bearing characteristics similar to modern otters and beavers. This animal was relatively large, measuring around 4 metres (13 feet) in length, which is more than twice the size of otters living today. Peregocetus’s terrestrial abilities were evidenced by small hooves at the tips of its fingers and the orientation of its hip bones, suggesting a quadrupedal gait on land. At the same time, it had tail bones similar to those of beavers and otters, which means its tail played an important role in its aquatic abilities. Finally, the size of its fingers and feet suggests webbed appendages, according to the researchers. The discovery adds new insights into the geographical spread of ancient whales at this stage in their evolutionary history. The four-legged whales likely reached South America by crossing the south Atlantic ocean from the western coast of Africa, according to the researchers. The animals would have been assisted by westward surface currents, and the distance between Africa and South America was about half of what it is today, making the trek manageable. Once in South America, Peregocetus settled in the Pacific waters along the Peruvian coast, eventually moving into North America. “We will keep searching in localities with layers as ancient, and even more ancient, than the ones of Playa Media Luna, so older amphibious cetaceans [a group that includes whales and dolphins] may be discovered in the future,” said Lambert. “This is a genuinely surprising discovery based on a relatively complete fossil skeleton that shows that really ancient whales capable of swimming and walking made it to the Americas much earlier than previously thought,” Erich Fitzgerald, senior curator of vertebrate palaeontology at Museums Victoria, Melbourne, explained in an email to Gizmodo. “It has really intriguing implications for our understanding of the evolution of whales. There may be this whole chapter of the whale evolution story that happened in South America and elsewhere on the coastlines of the Pacific and southern oceans that we didn’t know about,” said Fitzgerald, who is not affiliated with the new study. Palaeontologist Felix Marx from the University of Liège in Belgium said the new study is “significant” but “rather straightforward,” as there “isn’t much to criticise, here,” he wrote in an email to Gizmodo. Marx is good friends with Lambert, the lead author, and they share the same office, so he couldn’t “guarantee impartiality.” That disclaimer aside, he said the new fossil is “very convincing,” and it’s giving scientists a better idea of how these early whales spread across the globe.